In this image, taken by NASA's Spitzer Space Telescope, the mysterious gas cloud G0.253+0.016 is the black object on the left. The Milky Way's center is the bright spot at right. Astronomers have finally solved a longstanding cosmic mystery — why a super-dense gas cloud near our Milky Way galaxy's core isn't churning out many new stars. The gas cloud, known as G0.253+0.016, is simply swirling too fast, researchers said. And it lacks the requisite pockets of even denser material, which eventually collapse under their own gravity to form stars. The results suggest that star formation is more complex than astronomers had thought and may help them better understand the process, researchers said. The cloud is 25 times more dense than the famous Orion Nebula, which is birthing stars at a furious rate. But only a few stars are being born in G0.253+0.016, and they're pretty much all runts. "It's a very dense cloud and it doesn't form any massive stars, which is very weird," study lead author Jens Kauffmann, of Caltech in Pasadena, said in a statement. Kauffmann and his colleagues determined to find out why. Using the Submillimeter Array, a set of eight radiotelescopes atop Mauna Kea in Hawaii, they found that G0.253+0.016 possesses very few ultra-dense nuggets that could collapse to form stars. "That was very surprising," said co-author Thushara Pillai, also of Caltech. "We expected to see a lot more dense gas." The researchers then probed the cloud with another network of telescopes, the Combined Array for Research in Millimeter-wave Astronomy in California. CARMA data showed that gas within G0.253+0.016 is zipping around 10 times faster than gas in similar clouds. G0.253+0.016 is on the verge of flying apart, with its gas churning too violently to coalesce into stars. Further, the team found that the cloud is full of silicon monoxide, a compound typically produced when fast-moving gas smashes into dust particles. The abnormally large amounts of silicon monoxide suggest that G0.253+0.016 may actually consist of two colliding clouds, whose impact is generating powerful shockwaves. "To see such shocks on such large scales is very surprising," Pillai said. G0.253+0.016 may eventually be able to churn out stars. 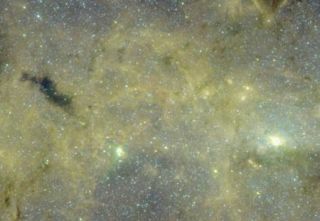 But its position near the center of the Milky Way could make it tough for the cloud to settle down, as it may smash into other clouds or be ripped apart by the immense gravitational pull near the galaxy's central black hole, researchers said. The study has been accepted for publication in the Astrophysical Journal Letters. The team also presented the results last week at the 221st meeting of the American Astronomical Society in Long Beach, Calif.